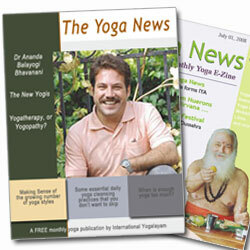 The Yoga News has moved! Your Emotional Stress Test – Are you spiritually insolvent? Never mind that people like you and me probably don’t have the foggiest clue how the level of unemployment could somehow tell us whether JP Morgan is stronger than Citigroup. The idea sounded good. What would it take, though, to make us take a similar look at our emotional health and our spiritual health? … to put ourselves to a stress test? Would it take an existential crisis? After all, it took the worst global financial crisis in history to make us force our banks in for a financial check-up. Put yourself in the following scenarios, and choose the answer that most closely resembles your likely response. Record the number of times you answered “A”, “B”, “C”, or “D”, then see the notes at the end of the stress test to determine your score and what it means. or some other vice to help you escape from your situation. yourself out of debt and “back onto your feet” again. See this as an opportunity to make a change in your life. approach to life, and have a very positive outlook for the future. don’t, then you will be forced to end your friendship. to overcome whatever troubles have led them to steal from you. bucks just to get rid of them. continue to use their product sometimes. immediately stop using their product. allegations, before passing judgement on them. permanent “sense of loss” for a long, long time. infinite, indestructible nature of mankind. whatever happens to you is your fate. you re-gain your health, and then make changes as best as you can. are willing and committed to do it. Is okay anytime, anywhere, with anyone. Is okay as long as both people are consenting adults. Should be enjoyed only in a loving marriage. the consequences of your actions. unable to understand why or what to do about it. continue to make unhealthy decisions over and over again. Something you do not care about at all. Essential, 100% of the time, without exceptions. Add up your total stress test points. 6-10 Looks like you found this stress test just in time. You are on the brink of spiritual ruin, but all hope is not lost. It may take a severe loss or great tragedy in your life to wake you up and push you onto the road to spiritual recovery. 11-15 You have several “spiritual red-flags” that demand attention. If you don’t make some changes in your life and your attitudes, your karma will eventually catch up with you! 16-20 You are still swimming on the surface of life. More effort is needed to penetrate life’s deeper dimensions and to start living with greater awareness and consciousness. 21-25 You have achieved a level of awareness that surpasses that of the majority today. Remember, though, that the higher one climbs, the greater the risk if one falls. Much work remains on the spiritual path, and you would do well not to meander too much. 26-30 You are perched on the threshold of enlightenment. Congratulations! Yoga Liability Insurance - Why you might not need it.